This will be one of the oddest reviews I’ve ever done. And I can’t say I wasn’t warned. I usually read liner notes pretty closely, and in the thank you section of Keegan McInroe’s From the Wall and In the City, I found this: “Thanks to all the musicians involved - my fellow painters! Their participation should in no way be taken as their endorsement of or agreement with the album’s politics or theology.” Neither should my review. I will say right now that I don’t agree with either, and nor am I asking my readers to do so. Why then am I reviewing this at all? There are several reasons. First of all, I ran a review of Keegan McInroe’s last album, Mozelle, and I enjoyed that one without reservation. So I felt that my readers would want a report on his newest effort. Second, I feel that my role is not to judge what an artist is expressing, but rather the artistry with which they are expressing it. And finally, while I am uncomfortable with some of the lyrics here, the music is astounding. Mozelle was a personal work that McInroe dedicated to the memory of his grandmother. The music was acoustic and the arrangements spare. I commented then that McInroe is a fine rhythm guitar player. From the Wall and In the City is a set of songs about how McInroe sees the current state of the world. These are indeed extraordinary times, and McInroe is inclined to see them in apocalyptic terms. To get that across musically, he has enlisted a full band, with electric guitars and organ parts in many songs, and with bass and drums throughout. But this is not just full tilt rock n roll. McInroe makes great use of the accordion on several songs, and there is trombone and even flute at times. The female background vocals have a gospel flavor that is very powerful, with Sarah Blacker being a particular standout. McInroe’s rhythm guitar playing is just as vital to the music’s success here as it was on Mozelle, but in a very different context. 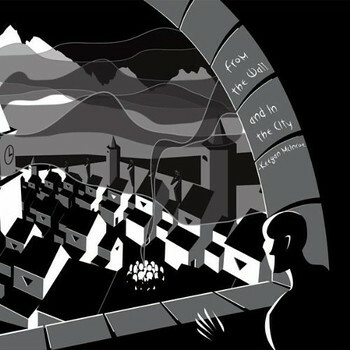 From the Wall and In the City is an album of dark songs, but not all of the lyrics are off-putting. The tone becomes more strident as the album goes along, and there are some real gems early on. The opening number is Dogs, and the dogs are a metaphor for humanity. The song doesn’t present us in the best light, but I find it to be a fair criticism. After a beautiful intro on the accordion, the song settles into a wonderful sort of alt country groove. The next song is Genesis Six Blues. Here, McInroe retells the story of the biblical flood, and there is the theme of sin and God’s punishment. But the tale is told with subtlety and even a hint of humor, giving only a glimpse of what will come later. The tone gets much darker with Revolution. The tone of this one reminds me of some of the classic art-rock ballads of the 70s. Think John Barleycorn Must Die or In the Court of the Crimson King. The chorused vocals on the refrain, as well as the trombone and flute parts, are all perfectly placed, and make this one a truly haunting work. Later in the album, I want to single out Down to the Pit. The song portrays a man who feels himself to be surrounded by the evil of the world. The song is a desperate prayer for God’s help in hard times, and while it does not jibe with my own spirituality, the song is the most personal work on the album, and I think it gives us a fair picture of who Keegan McInroe is. Powerful stuff. The last song on the album is The Ship’s Going Down. This one is an anthem that paints the grimmest possible picture of humanity as being awash in immorality. I think the sentiment is a bit much, but if the album needed one such song, this should have been it. Musically, it works, and there can be no doubt that this is how McInroe genuinely feels. There is other good work here, but, especially in the last half of the album, the lyrics become strident, either venting at corrupt politicians or loudly declaiming the coming Judgment. To be clear, my own political views are on the liberal side, but I don’t like strident political songs from Joni Mitchell or Billy Bragg any more than I like these. To sum up then. This is the first time I have heard Keegan McInroe with a full band, and I like the results musically. I hope that he continues with the musical explorations on display here. But I also hope that next time he returns to more personal material. And that will probably determine whether I review his next album. The good stuff is very good, so I hope so. Hey, Mr. di Place. My name's Evan Jones and I co-produced, engineered and mixed Keegan's album. I just wanted to compliment you on a great review! This album truly is all over the place. It was a true joy to record. I was able to hang with no less than 28 of Ft Worth's finest musicians for over 4 months!! It was like a guitar lesson a day! Anyway, great review, thanks for listening. And from the preproduction me and Keegan have done, don't be surprised if we go back to a stripped down feel! !